Situated on France’s eastern border with Germany in the historic region of Alsace and the “Grand Est”, Strasbourg is a truly European city with both French and German characteristics. The city has a medieval past, with twisting alleys and crooked half-timbered houses, among old fashioned Alsatian taverns or “winstubs”, akin to those in traditional fairy tales. Strasbourg grew from the Roman camp of Argentoratum which first appeared in texts in 12 BC. Strasbourg celebrated its 2000th anniversary in 1988, and the area between Rhine and the River III shows evidence of inhabitants since the middle Palaeolithic era. After being governed by the Bishops of Strasbourg the city became a Free Imperial City and then a French city in 1681. The city was later under German rule until 1918, the end of World War One, when it became French again. It came under German control again during the Second World War until the wars end. in 2016 Strasbourg was promoted from the capital of Alsace to the capital of Grand Est. Strasbourg is both a multi-cultural and a multi-faith city It is heavily influenced by both French and German cultures and Christian and Catholic faiths. In 2012 it became the home of the largest Islamic place of worship in France, the Strasbourg Grand Mosque. The official language of Strasbourg today is French, though historic German influence and German occupation during the First and Second World Wars mean that many residents also speak German. German is also taught in schools. Widely spoken is a southern German dialect, influenced by French, called Alsatian. You will see place names through the city in both French and German Alsatian. To obtain a work visa you need to have a job in France first. You’ll need to have your work contract approved by the French Labour Ministry and then the OFFI offices. Your employer should include your family in their application file and it will take around three weeks. If you are not planning on working but would like to stay for longer than 90 days, there is a visitor visa which takes around a month to process. As well as the usual identity documentation you will need a letter explaining what you plan to do in France, and proof that you can support yourself, proof of your accommodation and your medical insurance. For a student visa you will need financial guarantees, proof of enrolment, and other documents from Campus France. It takes about two weeks. There are also special visas for scientists, internees and diplomats. Two months before your long stay visa runs out you must apply for a residency permit (carte de sèjour) to remain in France. You have to take all your documentation to the local prefecture to file your application. You will need to prove your family situation, financial resources, employment contract, address, and have all your identification. You will also need to prove you have a good grasp of French. There is a US Consulate office in Strasbourg. The consulate can help American citizens in an emergency, help deal with passport issues, and offer certain other services. 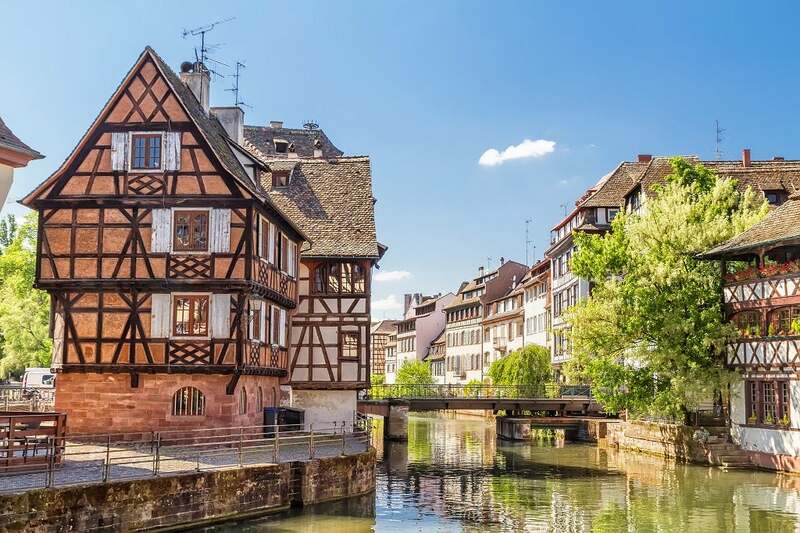 Strasbourg International Airport (SXB) provides routes directly to many European destinations, but to arrive in Strasbourg by air you will need to take a connecting flight to a major international airport such as Paris or Brussels, then transfer to Strasbourg. You may be able to take a freight liner or cruise ship and make your passage to France by sea. It would take a few weeks, and unless you have arranged space on a freighter it doesn’t mean you can take extra baggage. You would then need to make the journey from your arrival port in France to Strasbourg. A shipping and removals company will work with you to completely secure and transport your belongings to your new home in Strasbourg. If you take a full service, they will create an inventory, pack, load and transport from your old home to your new home, stress free. A shipping and removals company will also take care of things like insurance and customs requirements. You can ship your belongings ahead of time, so they are waiting for you when you arrive. If you are going to be waiting for the rest of your items when you arrive in Strasbourg, it’s important to pack what you will need immediately, and to pack appropriately for you how you will be travelling. Strasbourg is important to the French economy, particularly for manufacturing and engineering. It’s a hub of road, rail and river transportation and has the second largest port on the Rhine, the Port of Strasbourg. There are a wide range of professions available for migrants looking to live and work in Strasbourg. There are actually over 20 major European and international institutions based in Strasbourg, which is considered the legislative and democratic capital of the European Union. The European Parliament, European Science Foundation, and International Institute of Human Rights are just a few more examples. In most cases, you will need a good to excellent level of French language ability, both spoken and written to be able to work for a Strasbourg employer. Depending on the employer in Strasbourg, strong German language skills may be a suitable addition, or possibly a replacement. Requirements will vary from employer to employer so it’s important to understand their expectations. If you are starting your job search without knowledge of a suitable role, the chances are you will need one or more languages. You will need a CV/Resume and to write cover letters when applying for jobs in Strasbourg by post or email. Good job hunting etiquette is essential, the French expect this. Your French CV should be concise, a page or two at most. State schools will teach in French and expect a certain level of achievement in the language. Some may offer extra support in English. Attending a French school will help children to integrate into French society faster, but can be demanding. German lessons are common in Strasbourg. There are a number of international and bilingual schools in the Strasbourg area, included the reputed Bilingual International School of Strasbourg (BISS), which is no doubt utilised by many of the resident European government workers and diplomats from across the continent. Strasbourg has three major universities with around 45,000 students, including around 6,000 foreign students. They group into one European University Centre or Pôle Universitaire Européen. The three universities are The Université Louis Pasteur, The Université Marc Bloch and The Université Robert Schuman. Renting a three-bedroom apartment in the centre of Strasbourg will cost around 1,100 EURO per month, outside the city centre that falls to 792 EURO. A loaf of bread will cost 1.10 EURO, a dozen eggs 2.50 EURO, and a beer 3.75 EURO. A three-course meal at a mid-range restaurant is likely to cost around 50 EURO. Despite Strasbourg being a popular destination for high-level professionals the cost of living is no higher than other cities in France, such as Toulouse, at around 11% lower than the cost of living in Paris. (Source: Numbeo). In France they drive on the right, the same as the USA and Canada. The first phase of the French high-speed rail network, the TGV, was Paris-Strasbourg in 2007, then Strasbourg-Lyon in 2012. There are also standard rail services, all operating from the Gare de Strasbourg in the city centre. Trains run regularly to destinations in France and Germany, and to Strasbourg airport. The futuristic Strasbourg Tramway opened in 1994 and has six lines, and total track length of 55.8km, so a sizable city network. A similarly city-wide bus network integrates with the tram system. There are over 500km of bicycle paths across the city making it a convenient way to commute and travel for Strasbourg. The regional transit company who operate the buses and trains Compagnie des Transports Strasbourgeois also provide a value for money bike-sharing scheme called “Vélhop”. You can drive in Strasbourg with your US driving licence but should carry a translated, notarized copy. If you are a resident of France, and from certain US states, you can exchange your US licence for a French one if you apply three months before the 12-month period is over. For other US states you will have to take the French written and practical driving tests, once the 12-month period has expired. More information on eligible and un-eligible states for driving licence exchange can be found here. City centre property is in high demand and expensive, so you probably want to look at the outskirts of the city. L’Orangerie, Tribunal and Robertsau are the more expensive neighbourhoods. Otswald is close to school’s parks and leisure facilities, so is excellent for families. Koenigshoffen features historic homes, shared gardens and urban parks. Cronenbourg’s and Quartier de la Gare are being rejuvenated and are worth investigating for lower property prices. Next to Paris, Strasbourg is the 2nd most popular tourist destination. Visitors and residents alike love to explore the medieval streets, markets, cobbled squares, and gothic cathedral. Strasbourg is home to fine arts, museums, parks and many examples of both French and German culture. The Alsace style is one of pretty houses with timbered struts, and flower boxes, amongst the locks and bridges of the river. You can enjoy theatres, operas, concerts and festivals, or tour the many monuments and buildings. Strasbourg is as equally young and dynamic as it is historic. There is an excellent nightlife for students, visitors or residents. You can take a 70-minute city tour by boat through the city for an overview of all the major sites in the Alsatian capital including Petite France, the Covered Bridges, the Vauban dam and the Neustadt Imperial Quarter. Petite France has the quaint 16th and 17th century buildings, and was home then to the fisherman, millers and tanners. There is always something happening in Strasbourg, from festivals and concerts through to the month-long Christmas Market and festivities in December. The numerous museums hold events through the year including free visits, and “Le nuit des Musées”. “La Fete du cinema” (Celebration of Fims) occurs in May and “La Fete de la Musique” (Celebration of Music) in June. “L’Ill aux Lumieres” (The city under the lights) lights up the sights on summers evenings in July. For Bastille Day on the 14th of July there is grand firework display. Major sports teama include the Racing Club de Strasbourg Alsace (football), Strasbourg IG (basketball) and the Étoile Noire (ice hockey). “Internationaux de Strasbourg”, womens tennis, is one of the most important French tournaments. There aren’t too many ice rinks in France. Strasbourg is home to both an ice rink and ice hockey team. There are also many general sports facilities and swimming pools, 187 in total including professional level stadiums, 15 tennis venues, two equestrian centres and 9 bowling alleys.